Digital x-rays are a fast and comfortable way for us to more accurately diagnose your oral health needs. And with up to 90% less radiation and no chemical processing, digital technology helps us do our part to keep you and the environment safe, too. 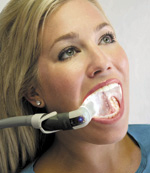 Using this camera, we can give you a “tour” of your mouth on a TV screen. We also use the camera to guide you through your diagnosis and treatment options. This is helpful in keeping our patients at the center of their treatment plans. We want you to feel informed every step of the way, so you can make smart choices for your oral health and smile. Happy patients spend less time in the chair with more comfort, so we use the Isolite® System. This system has a soft and flexible mouthpiece to shield your tongue and cheek during procedures. It has a light to illuminate your mouth from the inside, so treatments are shadowless and more efficient. AND it has a place for you to rest your jaw. It also eliminates the need for cotton rolls and rinse breaks. All because your comfort is paramount! We think you’ll especially appreciate the faster treatment times, so come in and experience the difference! Excellent dental care requires attention to detail and exacting precision. We must work in very small spaces and be accurate to a fraction of a millimeter. To achieve this, Dr. Pedraza uses the same special prismatic magnification glasses, or “loupes,” that surgeons use. Yes, we take your teeth that seriously!